The run above Cloverdale begins just above Squaw Rock and is the major class III rapid in this section. Squaw Rock and Graveyard are the only class III rapids and they occur at the start of the run. Novice boaters can avoid both rapids by putting in at Cummiskey Creek. 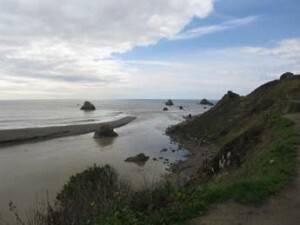 Although the Russian River is pretty much always right next to and in plain view of various 2-lane Highways and roads, (parallels Hwy 101 to Healdsburg, River Rd to State Route 116 in Guerneville and Hwy 1 from Jenner to the coast) it still has an almost pastoral Northern California charm. Where else can you amble past vineyards, riverside towns established in the 1800’s like Duncans Mills, pastures and eventually the Pacific Coast while surrounded by old bedrock that was long ago thrust from the seafloor into ranges peppered with Douglas Fir and Old Growth Redwood. If you are looking to hone your skills as an white water canoeist or inflatable kayaker, the Russian River is a good place to learn. For your first time, we recommend going with a guide or an experienced paddler.